It all starts with sound design: Original but grounded in history, simple but refined. We believe that precious materials augment sound design, but they do not compensate for mediocre design. The materials that constitute the Skram range are the finest of their kind. They are selected, matched, seamed, and joined by experts devoted to craft, not by machines. The character – perfect imperfection – of our materials affirms and enhances the identity of each object. Beyond the standard options, Skram products are fully customizable. The material options are truly limitless. Please contact our design department if you would like to discuss your project. Prospective clients may request physical samples from Skram directly or through a Skram representative to confirm selections prior to placing an order. Trade and contract clients may request a full sample kit (cork bento box with steel lid) containing comprehensive standard material/finish options for the complete collection. North American timbers form the core of our manufacturing focus for most casegoods, tables, and seating. These are harvested within 500 miles of our North Carolina workshop. Hardwoods are individually hand-selected for color and grain. Our solid timber products are constructed with mortise-and-tenon joinery throughout and exhibit matched seams and ‘waterfall’ edges as applicable. Our longwood veneer options offer a wonderfully diverse range of tones and textures. All of our veneers are hand-bookmatched and hand-stitched before bonding to stable, formaldehyde-free substrates with non-toxic adhesives. Products using veneer are protected with solid timber edges and corner inlay. With some exceptions, our product line is divided between items constructed of solid timber and those constructed of hardwood veneer. Some items are suitable for either fabrication process. A commonly held belief is that solid timber has a superior durability over veneer. Similarly, there is a view that the reason to use hardwood veneer is thrift. While both of these assumptions contain some validity, the reality is more nuanced. At Skram, veneer is not a shortcut or a cost-saving measure. Our decision to offer a given item in timber, veneer or both stems from structural and aesthetic considerations relating to a design. We hand-stitch and bookmatch furniture-grade veneers, then protect all edges and corners with matching solid wood inlay. The level of workmanship that characterizes our furniture negates deficiencies of durability that other veneered furniture might exhibit. For that reason, our lifetime warranty makes no distinction between timber and veneer-based products. In order to provide our clients with the highest quality leathers on our upholstered products, we partner with Wallsdorf Leather, which is renown for its unparalleled quality. Wallsdorf is a world leader in carbon neutral manufacturing and we’re proud to feature such beautiful material on our furniture. Standard options are shown below. Skram heavyweight leathers fall into two categories: character and architectural grade. These are selected for thickness and density, and are used to create leather clad door and drawer faces and for sling seat applications. Our architectural grade leathers are sourced in partnership with Spinneybeck leather. These are available in 26 colorways and offer a high level of water and stain resistance. Character grade materials are vegetable tanned and drum dyed using a traditional tanning process. Colors are limited to a range of earth tones. These hides may include stretch marks, scars, and even the occasional brand. From soft matte opaques to character-imbued patinas, Skram metals serve to contrast and complement to our timber and veneer selections. A matte opaque provides a calming counterpoint to the decadence of santos rosewood, while natural brushed stainless steel or bronze complement the quiet strength of walnut. Gunmetal steel, which is raw and laden with the intrinsic character and tool marks of the steelworker, seeks open-grained wood, like olive ash. Whatever your specification, our metals offer endless experiences and possibilities. Skram products are distinguished by the singular combination of materials and finishes, which blend tradition and craftsmanship with innovation. 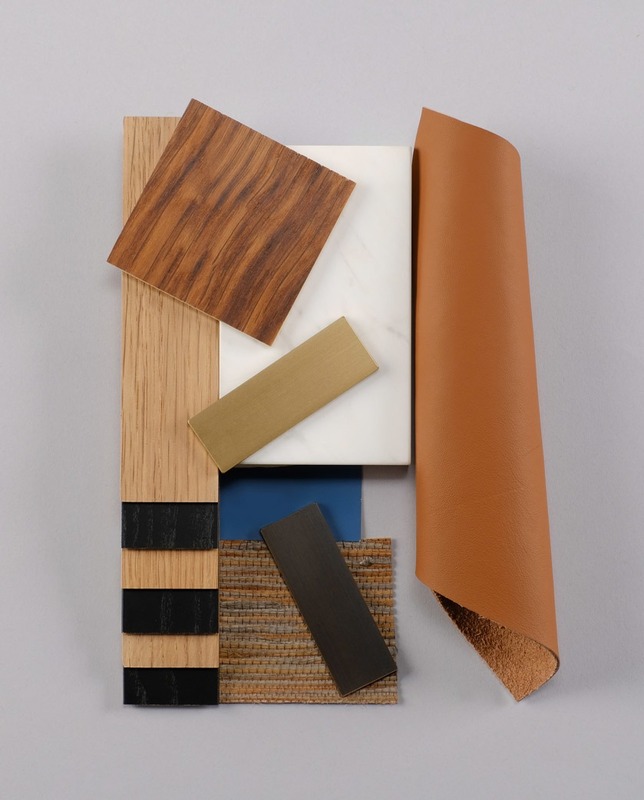 Alongside timber, veneer, leather and metal, we also incorporate a unique array of other materials, chosen for their ability to realize and enhance form and design.